It’s Kylee here today to share with you another update from my townhouse! The last time I showed you my coffee station, it was set up on a wine rack. That was probably one of the first things we did when we moved in. How else would we have survived unpacking without coffee?! It was cute and we made good use out of the wine rack, but we knew it wasn’t going to stay there. The wall it was on is pretty big and we needed something more substantial that could hopefully provide some extra storage, too. We had our eye on some large display cabinets, but recently my grandparents moved and gave us a really nice John Boos kitchen cart (similar one here)! It was a great (and free to us!) solution to our ever-growing need for more kitchen storage, so we repurposed our wine rack (I’ll show you where that ended up in a future post!) and replaced it with the cart. I added a floating shelf from Ikea above the cart for our bulk pantry jars, which helped clear off the kitchen counter. 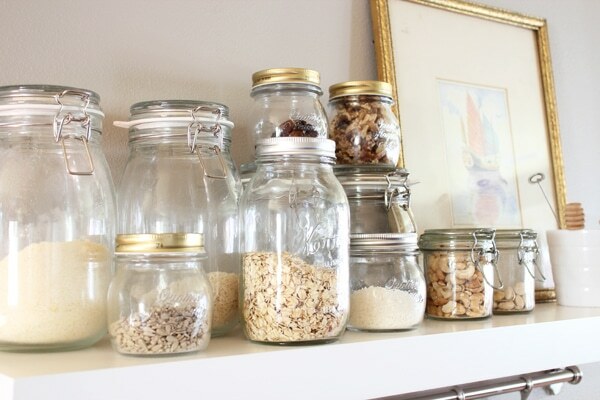 We really don’t purchase a lot of packaged food and don’t have a pantry, but we do keep a lot of bulk items in jars. Keeping them all out on the counter was starting to feel cluttered and took up too much valuable counter space, so wall shelf was the perfect solution! Some of our less-used jars are in one of our cupboards and a few in the basket on the bottom of the cart. We tend to cycle through them quickly, so it’s an ever-changing display of colors and textures. The handy utensil bar we used to hang the mugs also came from Ikea. My favorite part of every morning is coming downstairs and making coffee at our cute little cart. Weekday mornings we usually make Nespresso because it’s quick and easy, but on weekends we are all about the Bialetti or French press. We may put a larger display cabinet here eventually to hold more of our dishes, but we really love the cart! 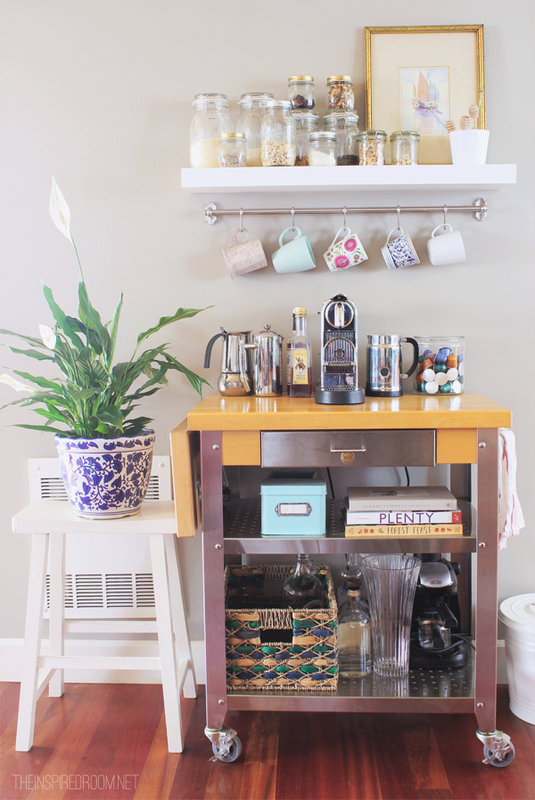 I’d love to give you tips on the 435 items everyone must have for the PERFECT coffee station (if you do want some ideas, my mom put together this post of coffee station tips) but around here, we are pretty much purists in the coffee department. Black, strong, maybe some milk and occasionally we may sweeten our second (third?) cup with a little vanilla, but first morning coffee is pretty serious unsweetened business. I guess it’s true, Seattle may have made us into coffee snobs who ironically aren’t Starbucks fans and demand very particular espresso to milk ratios on our lattes, but we’re not too far gone…no Chemex or Aeropress (not yet, anyway!). P.S. Any book signings coming up in the Seattle area? Would love to meet you someday! 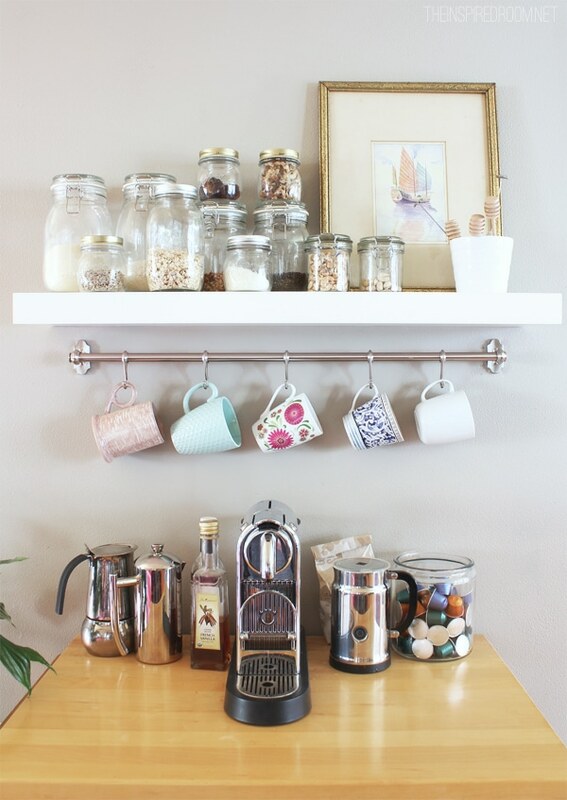 Love your coffee station and what you’ve done with the wall space above it. Just wanted to share another great idea my sister inlaw used for a coffee station/work space. They had just bought all new stainless steel appliances but were looking for something kind of portable, but a good size for a work area. They happened to be walking through the hardware dept. And this stainless steel piece just leapt out at them. It was meant to organize hardware and electrical tools. It’s about 4′ wide and 2.5′ deep. There are handy drawers, slide out shelving behind cupboard doors. It’s on rollers that lock if needed. And it looks great with the rest of the appliances. Sometimes you just got to think outside the box! Those are some great tips! Thank you! I love your new coffee station! Making your place work for you is so much fun. Who wouldn’t enjoy and look forward each morning to making their favorite cuppa in that space. Very elegant. Great job! I love this idea! Great post. As a reader from Melbourne Australia, we are also all about the prrfect coffee! Hi Kylee! I love your new Coffee Station! (I really liked your old one too!) But I know what it’s like to change things up a little when you can. I love that you used your floating shelf for extra food storage. I too, just purchased a new shelf for my kitchen to be used for extra storage. (Inspired by your Mom, when she recently decided to mix things up with her kitchen shelf!) I’m doing a little mini makeover just to freshen things up and create more storage in my cabinets. 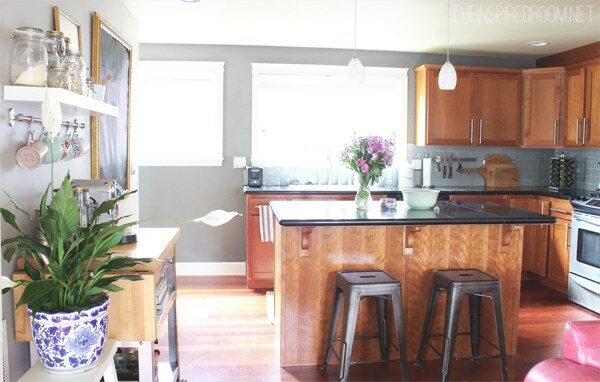 Your Coffee Cart fits in perfectly with your beautiful kitchen!! LOVE IT! Thank you so much for your sweet comment, Maria! Fantastic. Practical and stylish..the perfect blend. Love me a good cup of coffee and a cute coffee bar! What is the silver bar the cups are hanging from? A towel rack? !